Bald eagles (Haliaeetus leucocephalus) are protected under the Bald Eagle Protection Act as of June 8, 1940, as amended on October 23, 1972 and the Migratory Bird Treaty Act of 1918. Bald eagles remain protected under the Bald and Golden Eagle Protection Act. This act prohibits take where "take" is defined as "pursue, shoot, shoot at, poison, wound, kill, capture, trap, collect, destroy, molest or disturb". The U.S. Fish and Wildlife Service defines disturb as "to agitate or bother a bald or golden eagle to the degree that causes, or is likely to cause, based on the best scientific information available, 1) injury to an eagle, 2) a decrease in its productivity, by substantially interfering with normal breeding, feeding, or sheltering behavior, or 3) nest abandonment, by substantially interfering with normal breeding, feeding, or sheltering behavior". The Bald and Golden Eagle Protection Act outlines the federal prohibitions regarding the "take" and "disturbance" of bald or golden eagles, including their parts, nests, or eggs. The Migratory Bird Treaty Act outlines the prohibitions regarding the "taking" of any migratory bird or any part, nest, or egg, except as permitted by regulation. Bald eagle is listed as a state threatened species (regulation 123-150 Article 5 pages 67-85) and receives state protection as a nongame species (law 50-15-10) in South Carolina. U.S. Fish and Wildlife Service has developed bald eagle management guidelines to advise landowners, land managers, and others to minimize impacts to bald eagles and not cause "disturbance". If disturbance cannot be avoided, a federal regulation is in place that governs the issuance of permits to take, where the taking is associated with, but not the purpose of the activity, and cannot practicably be avoided. How do I obtain a USFWS permit? Permits are issued by USFWS Regional Offices, Contact the Migratory Bird Office (321) 972-9089. 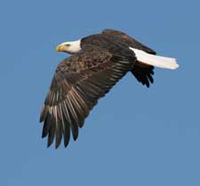 Permits for removing nests are only issued by USFWS to alleviate a safety emergency to people or eagles, to ensure public health and safety, where the nest prevents the use of a human-engineered structure, or the activity or mitigation for the activity will provide a net benefit to eagles.